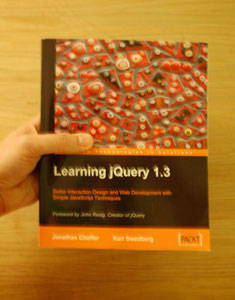 Known for publishing resources for the latest development trends, Packt Publishing has recently released an updated version their jQuery book: Learning jQuery 1.3, by Jonathan Chaffer and Karl Swedberg of Learning jQuery (the website). This new resource provides an excellent introduction to jQuery as well as going into detail on some of its finer topics. I’d highly recommend it for anyone who is fairly new to jQuery—it will give you a great head start in this wonderful and complex library. Starting off with a firm grounding in jQuery basics like selectors, events and effects, Learning jQuery 1.3 then goes into a few of my favorites: DOM manipulation the wonderfully simple jQuery AJAX API. After covering a couple specific jQuery solutions, the book ends with a discussion of useful plugins and how to develop your own. I’m really glad they shouted out the hard work of all the plugin developers, because jQuery wouldn’t be nearly what it is today without its countless plugins. And who knows, maybe QuickFlip will make it into their next book :). This entry was posted on Monday, September 14th, 2009 at 10:06 am	in the category front-end.